Letter from Hazel Skjersaa, the Maternity Nursing Coordinator at Valencia Community College, to Marie Jones Francis, a midwife in Sanford, Florida. In the letter, Skjersaa thanks Francis for a series of lectures she gave students in her home during April and May of 1975. Francis, the "midwife of Sanford," left behind a successful hotel and restaurant she owned in Sarasota in 1942 to return to Sanford and become a midwife. World War II caused a shortage in doctors and nurses, so Florida's Children's Bureau sent Francis to Florida A & M to acquire her practical nursing license in 1945. She specialized in premature babies and returned to Sanford to aid her mother, Carrie Jones, at Fernald-Laughton Memorial Hospital before they opened the ward in their home. "When her health starting failing," she recollects in a newspaper article, "I took over." Francis converted her house at 621 East Sixth Street to also serve as a maternity ward, where she delivered over 40,000 babies over her 32 year career. She became a midwife in the same vein as her mother, Carrie Jones, and together they ran the Jones-Francis Maternity Hall in Georgetown. 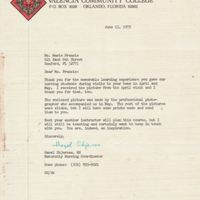 Original letter from Hazel Skjersaa to Marie Jones Francis, June 13, 1975: Private Collection of Daphne F. Humphrey. Digital reproduction of original letter from Hazel Skjersaa to Marie Jones Francis, June 13, 1975. Originally created by Hazel Skjersaa and owned by Marie Jones Francis. Copyright to the resource is held by Marie Jones Francis and is provided here by RICHES of Central Florida for educational purposes only. Thank you for the memorable learning experience you gave our nursing students during visits to your home in April and May. I received the picture from the April visit and I thank you for that, too. The enclosed picture was made by the professional photographer who accompanied us in May. The rest of the pictures were slides, but I will have some prints made and send them to you. Next year another instructor will plan this course, but I will still be teaching and certainly want to keep in touch with you. You are, indeed, an inspiration. 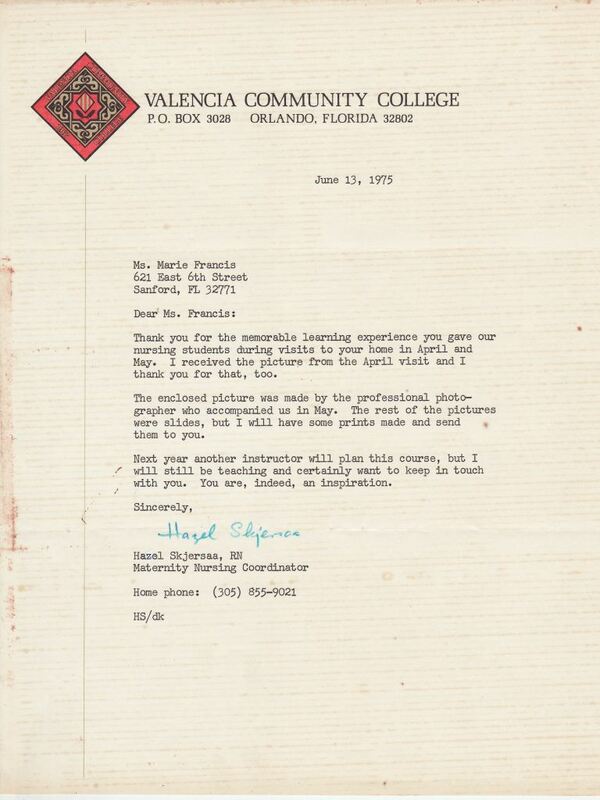 Firpo, Julio R.. “Letter from Hazel Skjersaa to Marie Jones Francis (June 13, 1975).” RICHES of Central Florida accessed April 19, 2019, https://richesmi.cah.ucf.edu/omeka/items/show/2961.